That’s it for 2015 at Kunst!Rasen then. 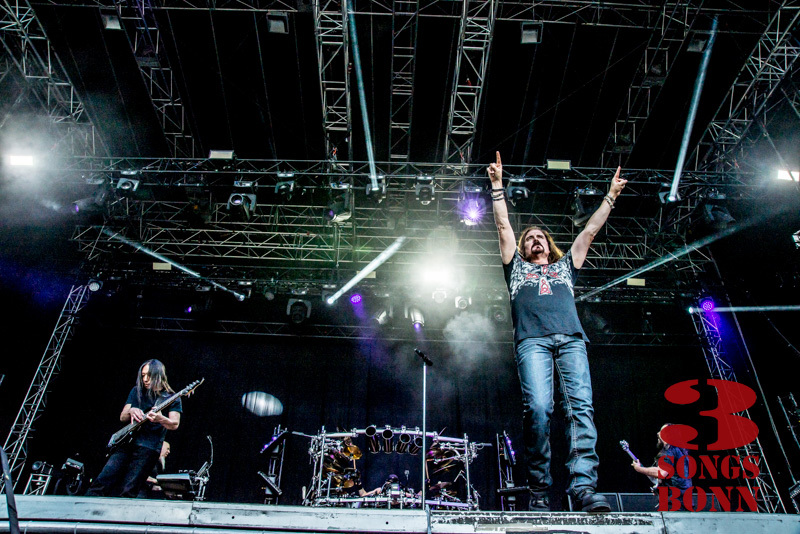 Only 22 days ago the young guns of Revolverheld were playing in the sunshine and here we were already with the rather older guns of Dream Theater firing a goodbye loudly and proudly. 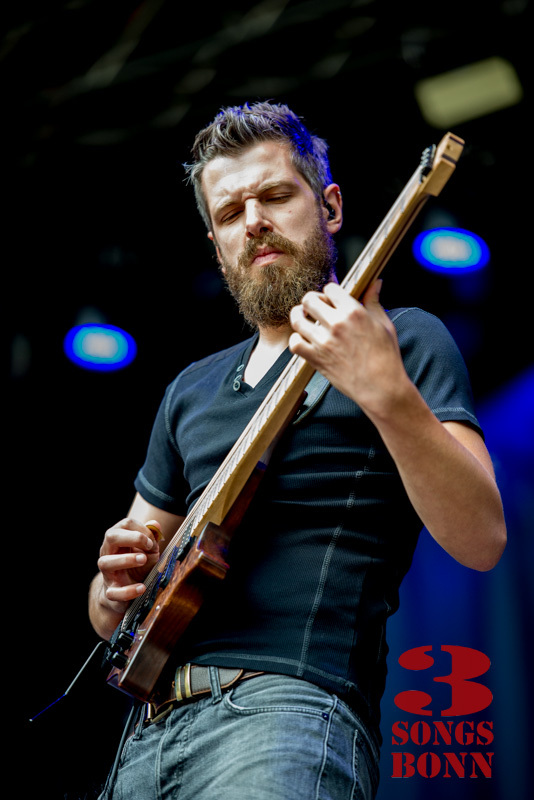 ‘Klassik Rocknacht’ 2015 might have lacked the star studded bills of years past like Deep Purple and Govt Mule in 2013 or Joe Bonamassa/Joe Satriani last year at Loreley but it was good to just hear some loud powerchords rip through the still evening air. 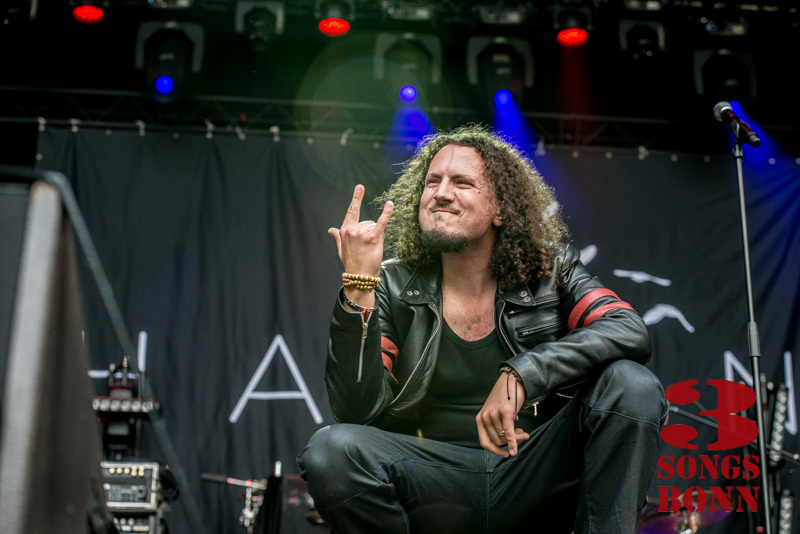 If you’re reading this sir, Haken were indeed not at all bad, and looked to be enjoying their place on a stage last occupied only last night by Joan Baez. How does “Iconic Band” sound? Anyway, for Progressive Rock fans these Londoners are certainly one to watch. I couldn’t make out the lyrics but lots of enthusiastic handwaving by vocalist Ross Jennings and if the sound reminded me a little of early Queen then I’m paying a compliment and also showing my age. 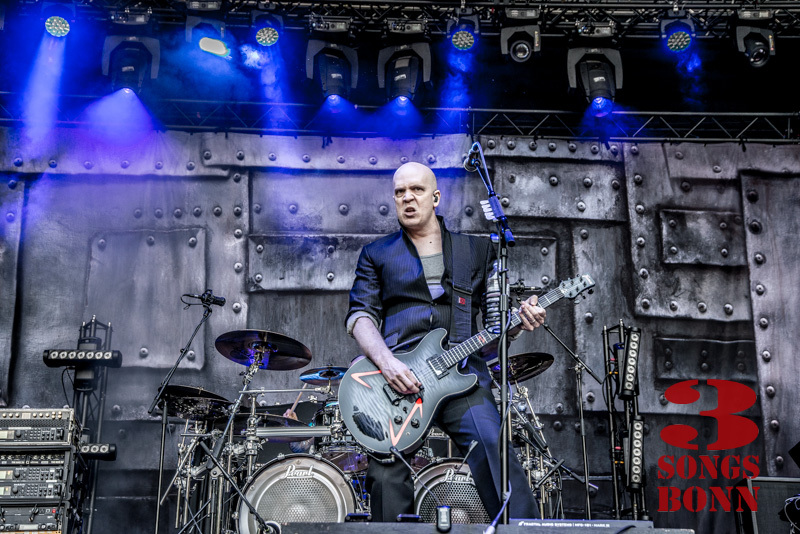 Canadian Devin Townsend is one of the new breed of crazy rockers it seems. “This is a song for my wife” he announces, before launcing into a metal extravaganza that certainly, to mis-quote Public Image Ltd ‘was not a love song’. Did he then follow that up by announcing “That was for my wife, and this one is for a farting alien”? He certainly looked crazy enough to have said it, but my ringing ears told me I might have mis-heard and I headed for safer waters – beer actually, from the refreshment booth well away from stage and speakers. I was still close enough to see smoke coming out of Devin’s customary for Metal music flying V guitar though. “You don’t have smoking guitars over here?” he quipped. “Over in Canada there’s loads of them”. I thought about heading back to the stage area but caught the announcement that “It smells like puke up here!” So decided to enjoy my beer from a safe and puke free distance. Townsend has the ‘haircut’ and blazing eyes of Wilko Johnson and truthfully I would have preferred to see the likes of Wilko here tonight. The music itself wasn’t so far removed from that of the previous band but there was a thickness about it that said, despite the seeming disdain for order, these guys were a league higher. Power chords with bass and tonsils at max. Which brings me on to the last band onstage at Kunst!Rasen 2015. 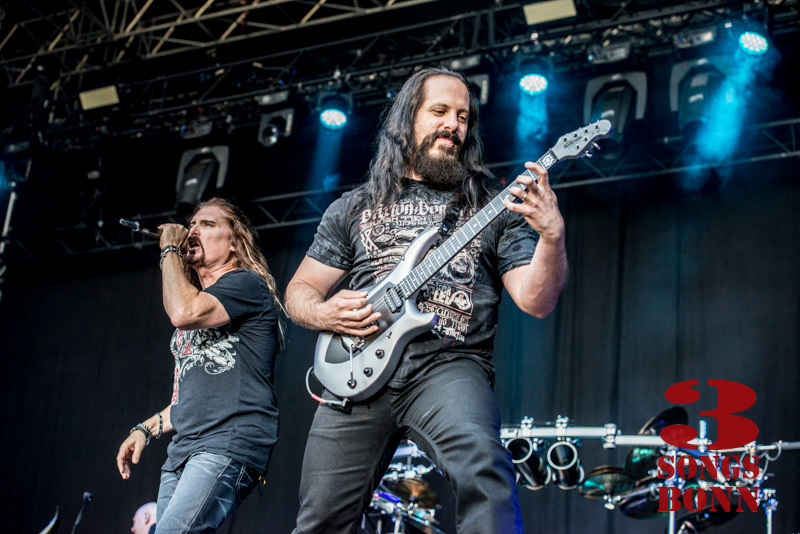 I’m not a huge progressive rock fan but if I were I would probably consider Dream Theater as one of the sounds movers and shakers. 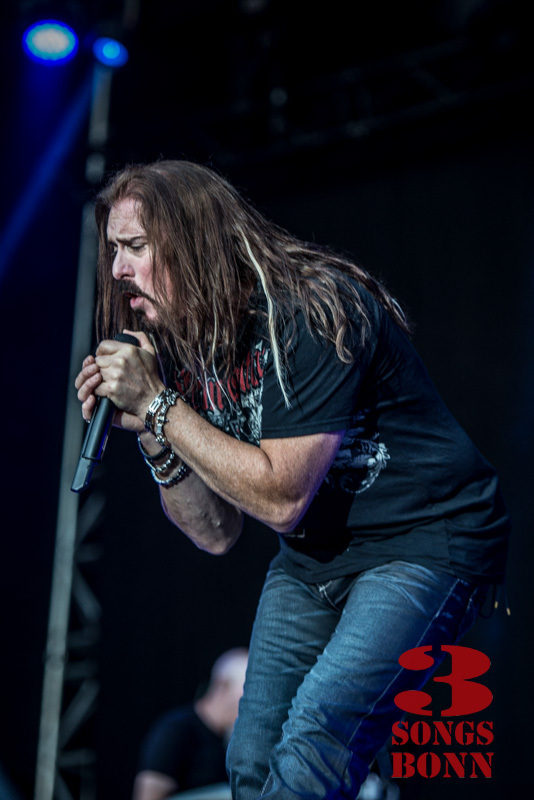 This is their 30th Anniversary Tour and being celebrated in that vocalist James LaBrie announced they would be playing something from every album they’ve released in their long career. On the basis that Prog Rock songs can run for some time I wondered if we would be leaving before Kunst!Rasen 2016 began. Not being an expert on the genre (My last prog rock show was probably Tangerine Dream at Portsmouth Guildhall in the 1970’s) I can say that Theater pack a musical punch and that they veered more towards the Hard Rock/Heavy Metal side of the loud spectrum which meant (thankfully) the tracks were of manageable length. I most enjoyed the compositions that had some dynamics in them and this was especially so of ‘The Spirit Carries On’ – a Hard Rock drama in the majestic style of Queen and with some fine and thoughtful lyrics: “If I die tomorrow, I’ll be alright. Because I belie, that after we’re gone – the spirit carries on”. Not Shakespeare, but the perfect stuff of a hard rock ballad and one for the cigarette lighters to be waved to – if only it were dark enough to see them. A hard rocking, fist thumping, ‘Take me as I Am’ and a frantic ‘Constant Motion’ from 2007’s ‘Systematic Chaos’ showed the band’s class as a metal unit and I enjoyed watching Jordan Rudess swinging his keyboard around on the stage as much as I enjoyed hearing him play it. 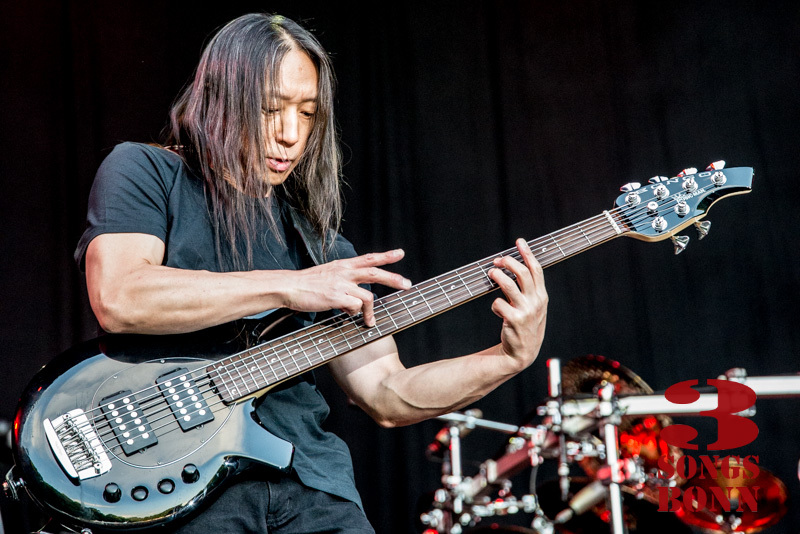 Bassman John Myung seemed up to the challenge of playing anything in any key at any time with a quiet dignity and style whilst guitar maestro John Petrucci shredded notes like I haven’t seen them shredded in a long while. Deep Purple would have dubbed him a ‘Speed King’ for sure but he also had a light touch as evidenced on ‘Wither’ from 2009’s ‘Black Clouds & Silver Linings’. Encoring with ‘Behind the Veil’ was a good way to make sure we were all wide awake and energized for the journey home. No one was going to be sleeping in the cool Summer Air round the corner at Kunstgarten this evening. Ah Kunst!Garten. That’s where the music will be from now on until October as the big stage gets put back in it’s box, hopefully to come out again next Summer. If you came to a show or three – I salute you. Let’s keep making top quality world class music available open-air down by the Rhine.